ElasticBox, a startup that aims to make developing and deploying apps on any cloud infrastructure easier, today announced that it has raised a $9 million Series A round from Nexus Venture Partners and Intel Capital. The company previously raised a $3.4 million seed round led by A16Z Seed and Sierra Ventures. According to ElasticBox CEO Ravi Srivatsav, the company plans to use these additional funds to continue to invest in its research and development efforts and to increase its sales force, especially in Europe and Asia. ElasticBox aims to solve a major issue for developers: How can you make sure you write an application once and then easily deploy it on any cloud architecture without locking yourself in. ElasticBox solves this by encapsulating the components of your application architecture into what it calls “boxes.” These boxes, the company says, are basically encapsulated, fully configured components of your application architecture that can be combined to create and run applications in the cloud. It’s easy enough to provision infrastructure these days, Srivatsav argues, but what happens once you have your 10 virtual machines up and running? To put your application together, you still have to install lots of databases, runtimes, frameworks and other components. And once you have the individual machines up and running, you still have to get them to work together. With tools like Chef and Puppet, that process has gotten quite a bit easier, he admitted, but how can you make this whole process easily repeatable inside an organization? What if you want to share your Hadoop setup on VMWare with a group inside your company that uses AWS? Or what if you want to move it to AWS yourself? With ElasticBox, developers can make their boxes available to anybody in the company and ElasticBox itself offers a few dozen boxes. The service, Srivatsav told me, captures as much information about your architecture as it needs to replicate it without making the data too specific for a given platform. While this concept of “boxes” may sound a bit like what the Docker team is trying to build, ElasticBox argues that the two are actually quite complementary and were built for different purposes. The company currently offers a free SaaS version of its service for developers that supports deployments to AWS, Rackspace and Google Compute. 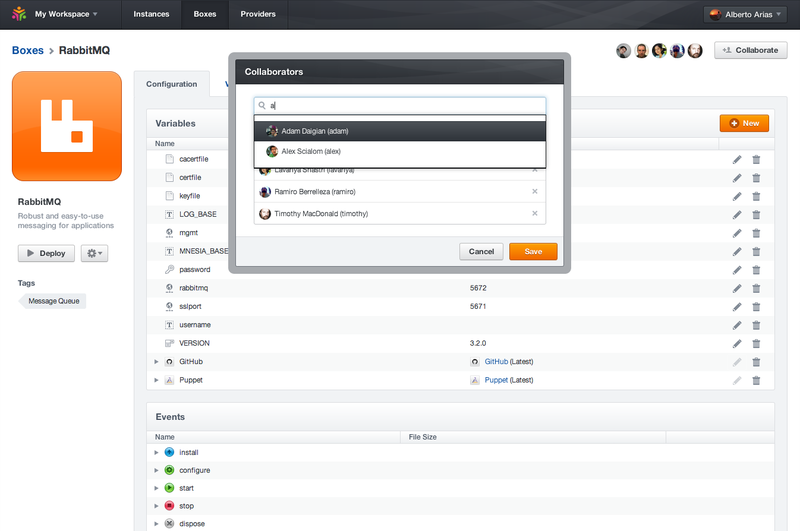 Users on the SaaS version also have access to the 50 or so boxes the company currently makes available to its users. The enterprise version also supports HP Cloud, OpenStack and vSphere. It’s also available as a virtual appliance.